It would be hard to imagine a better place to settle down for a few days for Terri to relax recover and easily visit her doctor for a final check before we hit the road again. Since this campground sits next to the ocean it is wide open to the frequent hurricanes that hit this coast in the summer and early fall. Looking at the place you'd never be able to tell. Seems like each time we visit the accomodations improve. It's a large grassy plot surrounded by a seawall, mounted with cannons. 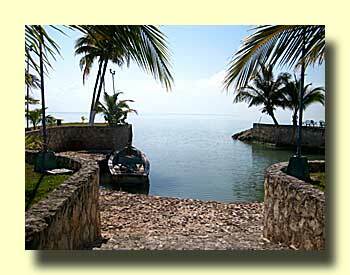 You feel like you're in a Carribean fort, well-protected against pirates. There are electrical hookups, water, a dump station, palm trees, swimming pool, a tropical grass-roofed palapa restaurant, and even a considerate and helpful English-speaking manager. Actually, we began to feel a bit restless today so we drove up to Xcalac. It's a small town on the coast only 30 miles to the southeast of Chetumal, but to drive there you have to cover 120 miles. All of it is good paved road, this is a pretty acccessible place, even if it is remote. 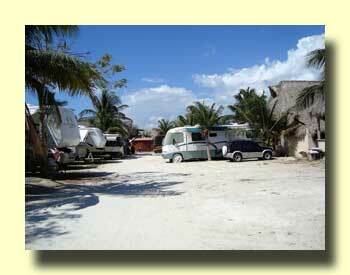 Xcalac is about as close as you can get to being on one of the Cays in Belize - but with an RV. There can't be more than 200 people in this sleepy beachside town, most of them are fishermen or serve the few tourists that arrive to go diving on the excellent offshore reefs. There's one campground (really a very small palapa village) where RVers can park in the lot, but most visitors park their RVs along the idylic waterfront. 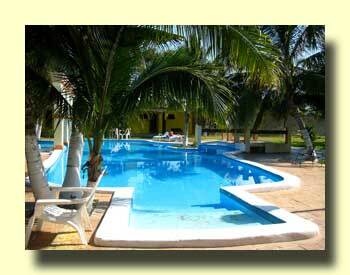 We need to spend about a week here, maybe next year. 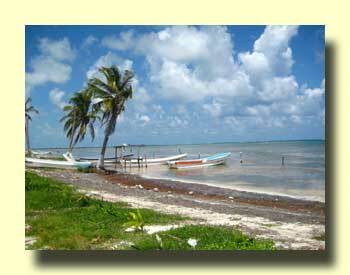 What a culture shock it is to arrive in this part of Mexico! A four lane highway. Construction everywhere. Fly-in tourists thick, most of them in tour busses. Huge Disneyland-like attractions every few miles. Housing developments with the fanciest entry gates you've ever seen, probably not in our price range. 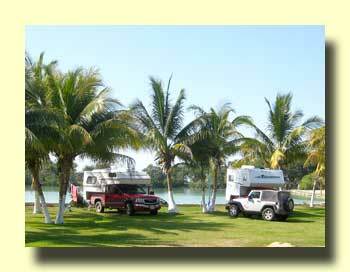 The Paa Mul campground has always been a kind of refuge in an area with few other RV parks. The big attraction here is a beautiful beach out front. That and the fact that it is a full-hookup park in an area known worldwide as a tourist destination. There's a flip side though. PaaMul has dusty access roads, crowded and unnatractive sites well back from the beach, poor restrooms, and busses full of people from outside the park visiting the restaurant and pool. Paa Mul looks a little less like a refuge this year. We normally don't carry dollars while traveling in Mexico. We figure we're in Mexico and that's what they use down here. Not to mention that we almost always get a better price when we buy something with the local currency rather than dollars. 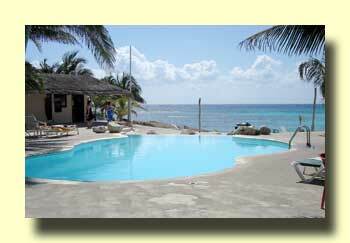 Imagine our surprise when the manager at Paa Mul quoted us his nightly rate in dollars. That happens a bit along the west coast, but it's been quite a while since we left Mazatlán. Actually, with the value of the peso jumping around so much this year it makes some sense to quote dollars rather than pesos. On the west coast this year it was common practice to quote in dollars and then give the peso a low value (sometimes even as low as 10 to the dollar when the going rate was 13). Campground owners had heard about the financial crises up north and were doing their best to cushion the blow a little for their guests. In fact, the coversion rate used is actually something to pay attention to. If the quoted price is $25 a night and the bank rate is 13 pesos to the dollar, you save over $5 if the campground owner uses a rate of 10 rather than 13 in calculating what to charge you in pesos. If you're paying for several months you'll want to be ready with the prefered currency. The consideration given by campgrounds on the west coast made it even more shocking when the manager at Paa Mul, despite protests, used an incorrect rate from last week to squeeze a little more out of us. It wasn't more than a few dollars, but it's another reason Paa Mul looks less like a refuge from the Cancun madness to us.